I’m envisioning some lonely boats on the sea, crossing the Pacific today. 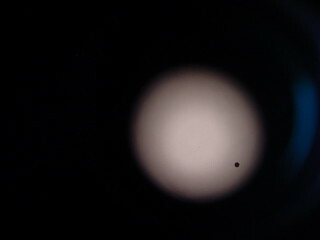 They’re going to be privy to the best sight of the transit of Venus across the sun, an event the whole world is buzzing about. NASA has a lot of information and super neat ways to see what’s going on, so check it out. Something I love about being on the water is being more connected to natural phenomena like this celestial event. Other things I notice more are shifts in wind direction, wave direction, changing clouds and weather, and other things that are perhaps too subtle for land dwellers to notice. I hear big fish chasing little fish, porpoises breaking the surface of the water to breathe, and the first bird songs of the day. The next time the transit will happen will be in 2117 and 2125, so here in the northern hemisphere I’ll most likely be parking up on top of Caterpillar Hill here on the Blue Hill Peninsula in Downeast Maine at sunset in hopes of seeing something. A little black dot on the sun, an entire planet shadowed by the great big ball of energy that makes sailing happen in the first place. Wow, we’re small. This entry was posted in Uncategorized on June 5, 2012 by Anne.